In response to the first question at his annual international press conference in Moscow, Vladimir Putin said he was in favor of banning the adoption of Russian children by US citizens. The question dealt with legislation that seeks to prohibit the adoption of Russian orphans by US citizens. The bill, part of a package of measures drafted by Russian lawmakers in retaliation to the US Magnitsky Act, was approved this week by the Lower House in the second reading. Putin answered that the Magnitsky Act should be prioritized as it is a deliberately unfriendly piece of legislation aimed at Russia (The act is named after lawyer Sergey Magnitsky, who died in pre-trial detention in Moscow in the course of a massive tax fraud investigation. In addition to banning individuals who US officials believe were involved in the death from visiting the US, it also freezes their US-held assets). The United States “replaced one anti-Russian law with another,” and this indicates that our foreign partners are living in the past and intend to maintain relations “rooted in a standoff between two systems,” the Russian leader stated. Speaking on the proposed adoption ban (named in honor of Dima Yakovlev, a Russian boy who died as a result of being left inside of a car on a hot day by his adoptive American parents), Putin said that to his knowledge the majority of Russians disapprove of foreign adoptions. He added that he fully agreed with Prime Minister Medvedev who said that Russia should develop its own adoption system. The President told his audience that the amendment is not against adoptions per se, but rather a response to the US judicial system that regularly denies Russian diplomats from monitoring the wellbeing of Russian children adopted by US citizens. Putin called this practice “a humiliation,” saying that no one should have to tolerate such an attitude. 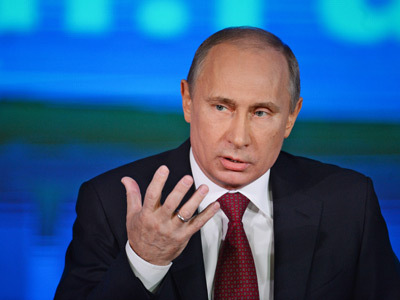 Meanwhile, Putin called the response from the State Duma “very emotional,” but still adequate. However, as reporters continued to push Putin on the adoption issue, the Russian leader admitted that he has not yet examined all the details of the Dima Yakovlev bill. However, Putin assured his listeners that he would study the Russian-US adoption agreement before moving to sign the bill into law. But when the reporters continued to press on the Magnitsky Act, Putin said U.S. lawmakers would have needed another piece of anti-Russian legislation without it. 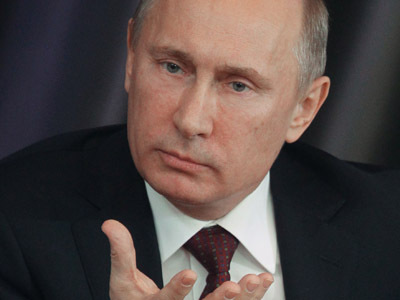 “This saddens us," Putin added. 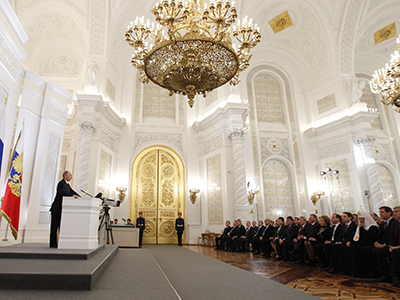 Speaking on the subject of the interstate adoption agreement, Putin noted that if either Russia or the United States intends to revoke it they should provide a year’s warning. When reporters pressed for the President’s personal reaction to the Duma's move to ban adoptions, Putin repeated that he understood the position of Russian MPs and disagreed with those who criticized him as a politician who "heeds a decision passed by a democratically elected parliament." He explained that laws that are handed down from the parliament must not manage the fates of individuals, but regulate the rules of behavior, and the adoptions ban is an attempt to influence the behavior of America. However, the Russian leader admitted that things “got relatively worse” between Moscow and Washington lately for several reasons. First, the countries shared different views on the situation involving Iraq, which the United States attacked after accusing it of harboring weapons of mass destruction. “They (the Americans) said: ‘I came, I saw, I conquered.’ Well, Saddam [Hussein] was executed, but the country is falling apart,” Putin observed. “(Since the beginning of the US military offensive) there have probably been more victims than during the entire reign of the Hussein regime,” he noted. The measures that the US took in Iraq were “doubtful, to say the least,” he added. Another problem in the Russian-American relationship involves the deployment of the US-sponsored missile defense shield in Europe. “We’ve repeatedly said that we view the development of this system as a threat, and if we don’t respond, it could lead to the elimination of [Russia’s] nuclear-missile potential,” Putin stated. As a result, the President continued, the regional strategic balance – which has thus far spared humanity from large-scale military conflicts since WWII – would be upset. The Russian leader also disagreed with the term “reset” that has been applied to relations between the two former Cold War enemies after it was first suggested by American side. “What should be reset? We have good, normal relations,” he stated. On a humorous note, a correspondent from the Russian web tabloid LifeNews ventured to ask the President if he is aware that there are quite a few anecdotes about him. “Your assistants probably told you,” the reporter said. “No, they are scared to tell,” Putin replied, without missing a beat. The date picked for his media conference – one day before rumored ‘doomsday’ – was also the subject of ironic comments. “I know when the end of the world will come,” Putin stated. “In about 4.5 billion years,” adding that the sun’s life is expected to end by then and the “reactor will turn off.” But before that, the sun will become a white dwarf, the President observed. In any case, “the end of the world,” does not scare Russia’s leader. “What to be afraid of if that is inevitable,” he asked rhetorically. One journalist remarked that Putin has created a “rather rigid regime of personal power” and asked the President if he considered such a system viable. Putin answered that he cannot call Russia’s present system of government “authoritarian,” and supported his statement by reminding the packed hall of international journalists that he stepped into the Prime Minister position after two presidential terms. The President said the media must understand that he had an opportunity to change the constitution and remain president for a third term if he wanted to – especially since his supporters held the constitutional majority of parliamentary seats. “I left for the second position in order to assure the succession of power and respect of the Constitution,” he noted. 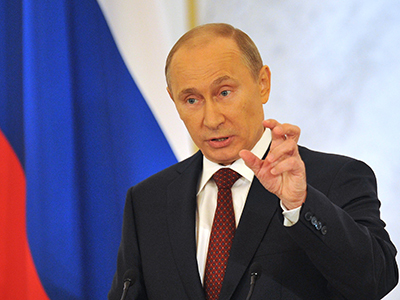 The Russian leader then provided some food for thought on the subject of democracy. Speaking on the subject of Moscow-Tbilisi relations, Putin blamed Georgian President Mikhail Saakashvili for bringing the situation to a deadlock. On the question of Russia recognizing the sovereignty of South Ossetia and Abkhazia, Putin emphasized that the decision is “irreversible.” Nevertheless, the Georgian leadership refuses to recognize the independence of the two republics as it accuses Russia of “occupying” their territory. 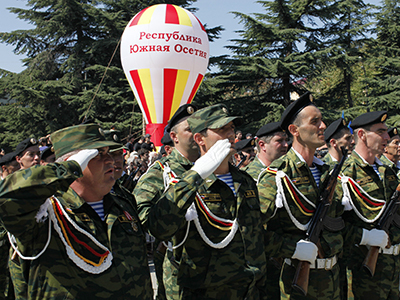 Relations between Moscow and Tbilisi hit rock bottom after a five-day military conflict in August 2008 that began when Georgia opened a full-scale military offensive against South Ossetia, where Russian peacekeepers were stationed. The Russian military intervened under the CIS peacekeeping agreement, forcing Saakashvili to abandon his plans for seizing the territories. Today, Moscow welcomes positive signals coming from Georgia after a shift of power following the parliamentary elections in the former Soviet republic, Putin said. One of those “still very restrained, but positive” moves was the decision by the new Georgian Prime Minister Bidzina Ivanishvili to introduce a post of Special Representative for Relations with Russia. Earlier in November, former Ambassador to Moscow Zurab Abashidze was assigned to the post. 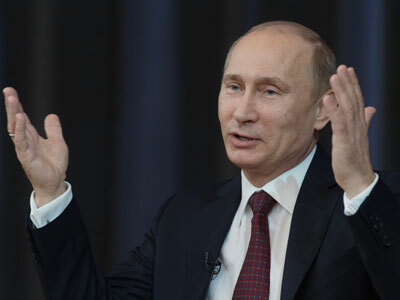 “Moscow responded the same way,” Putin said, referring to a recent meeting in Geneva between Abashidze and Russia’s Deputy Foreign Minister Grigory Karasin. The two diplomats agreed to look for ways to improve Moscow-Tbilisi relations. Putin categorically rejected speculation that he somehow influenced the court responsible for hearing the Khodorkovsky case. 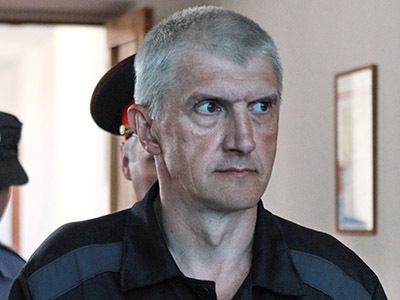 "Look, you have the wrong idea about how our judicial system functions," the head of state told the reporter who suggested that commuting Khodorkovsky's sentence was due to a change in the president's position. 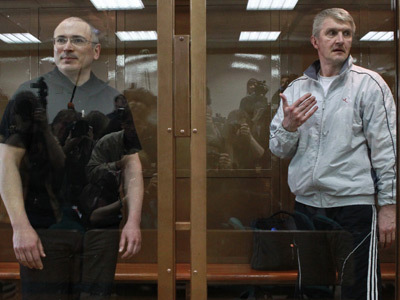 The Moscow City court reduced on Thursday the sentences Khodorkovky and Lebedev from 13 years to 11 years.The decision was made following earlier adopted amendments to the Penal Code, which softened liability for economic crimes. The tycoons will be released from prison in 2014. "I could not influence in any way – I wish all of you to hear – I have not influenced the activity of law-enforcement or judicial bodies in any way,” Putin said. “I never meddled in this area; I was doing my work." Certain amendments to the law have been made, and they (legal documents) probably persuaded the court to make the decision you mentioned. The head of state also denied the prosecution of Khodorkovsky for personal or political reasons. "As for MikhailBorisovich (Khodorkovsky), there is no personal prosecution here. Everybody is trying to make a political case out of it…Why? Did Mikhail Borisovich engage in politics? Was he a deputy or a party leader? He never was. It was a purely economic crime." Putin then reminded the press conference about certain high-profile economic criminal cases in the United States, where the culprits might be sentenced up to 100 years in jail. "Don't politicize the issue," he said, adding "I'm confident that, in accordance with the law, everything will be OK and Mikhail Borisovich will be released from prison, may he keep healthy." About 1,200 Russian and foreign journalists have been accredited to the Russian President’s press conference, which has become a major annual media event. This year there was a break in tradition and the event took place not in the Kremlin, but in the Moscow Center of International Trade. The Q&A press conference was broadcast live on all federal major TV channels and lasted for 4 hours and 33 minutes.